It’s never too late to get started on your personal brand. In fact, college graduates are now advised to work on how they present themselves to a potential employer. For brands, this guide will be useful for you when you’re trying to research social media influencers in your field. Is the potential influencer’s personal brand strong and consistent? 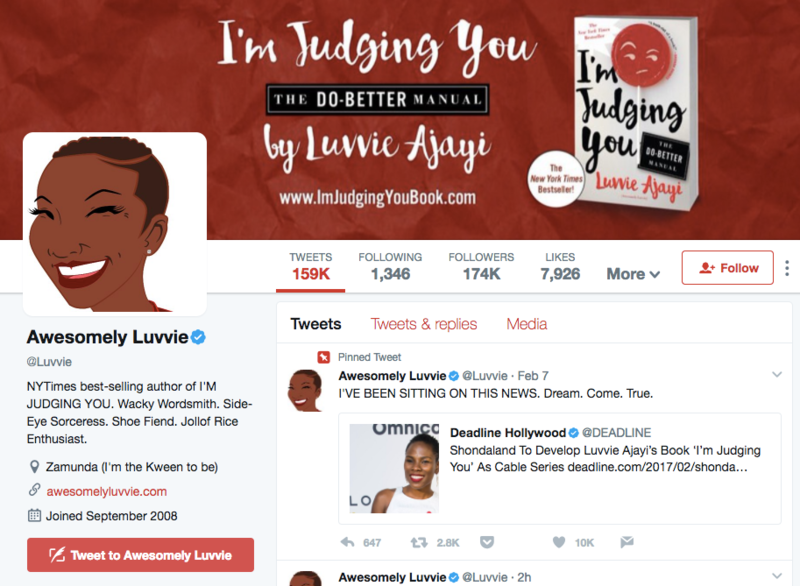 Luvvie Ajayi is her own brand. With the power of personal branding and professional services, her career has skyrocketed to most recently, a book deal. You’ll be able to see from all of her online personas that she has her personal branding locked down. Just like corporate branding, personal branding is a representation of you on an individual level. For some people, personal branding is synonymous to social media influencer, but that doesn’t have to be the case for everyone. The presentation of personal branding online involves creating a voice, personality, logo, biography and even the topics you want to be known for. What you don’t want to end up with is a boring and robotic account. Perhaps even worse, a mismatch between your online persona and your real life persona. For the average person online, you may think that personal branding is completely unnecessary to your life. This may be true. However, if you use Google, Facebook, Twitter, Chrome or any other online service that requires some of your private information, your persona is already being documented somewhere. Taking control of how you present yourself is the best way to tackle what comes up when someone Googles your name. In truth, you already have a personal brand. It’s based on aggregated data of your purchasing habits, browsing history and all of your social media posts. It’s established with or without your control. But is it what you want it to be? 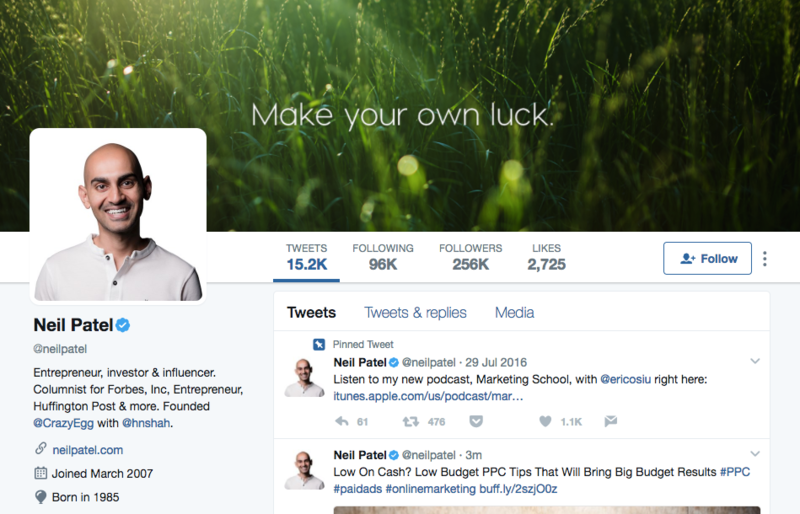 Neil Patel is best known for being a marketing genius and his website, content and other social media profiles reflect this. Establishing a personal brand that you’re proud of is an ongoing project. It takes time to create a vision of what you want, and to then execute that vision. Nike did not establish their brand overnight and neither will you. What do you want to be known for? This isn’t the existential version of the question. Much like how companies set social media goals, you want to set your own personal branding goals. 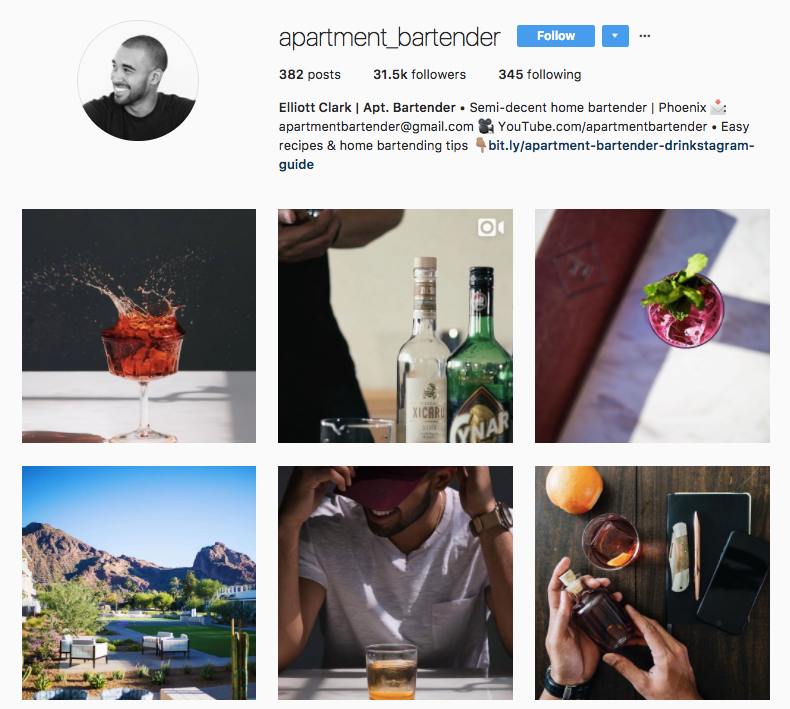 Elliott Clark is the Apartment Bartender. His personal brand has a different name but it’s all him. The profile photo is him and his website has his face and personality all around it. When you’re establishing your goals, take a look at other people you admire and how they present themselves online. These include known thought leaders in your community as well as industry experts. How do they post and what do you like about them? What you want to be known for usually doesn’t match up with what you’re currently known for and that’s OK. Growth is important in every part of your life and that’s why the next step is key in personal branding. The easiest way to audit yourself is to search online for your name. Make sure your internet browser’s cache is cleared or that you’ve opened the search in a private browsing window. This way you can make sure you’re receiving the same results as anyone else would be when searching for your name. 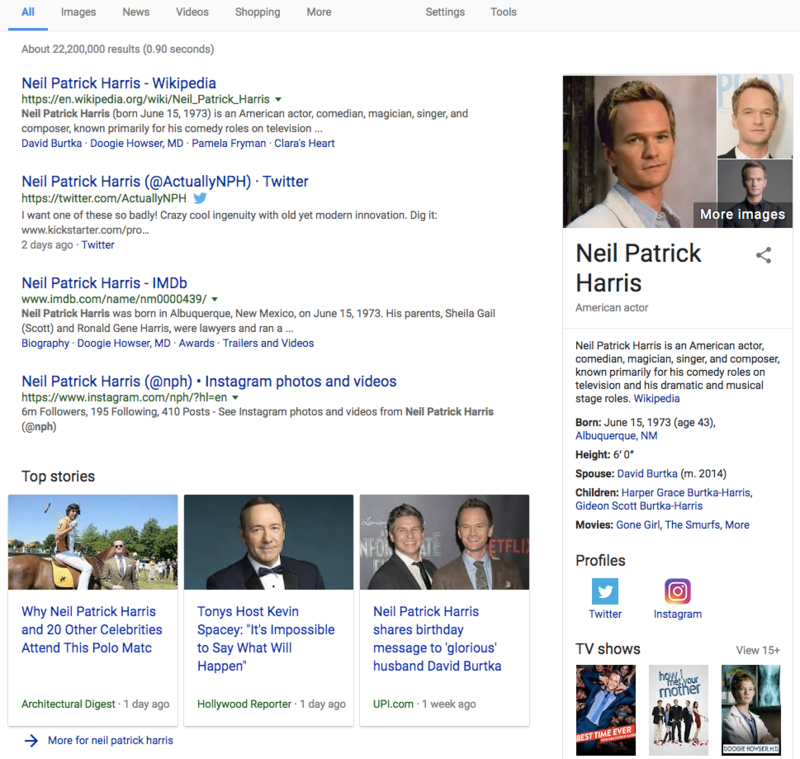 In a search for Neil Patrick Harris, an actor with a very well-known personal brand, you’ll see that the first page of results include his Wikipedia page, a snippet, plenty of stories and various profiles. When you click over to look at an image search, the first photos to pop up are all of him. When searching for yourself, take note of who else pops up if you have a common name. How can you make yourself stand apart from everyone else? Don’t just stop at your name either. Search for combinations of your name with keywords from your goals. Now it’s time to take a look at your social media profiles and website. Approach this audit like you would for a brand. Profile consistency: Profile photo, bio, cover photos and website links are all similar. Overall look: Colors, fonts and style are all similar. Website: Whether it’s through an about.me page or your own site, you have all of your social media profiles linked in one place somewhere. Social media handles: If possible, make sure all of your social media handles are the same. If your name is too common, either find a new username or create separate public profiles that can be distinguished from your private ones. 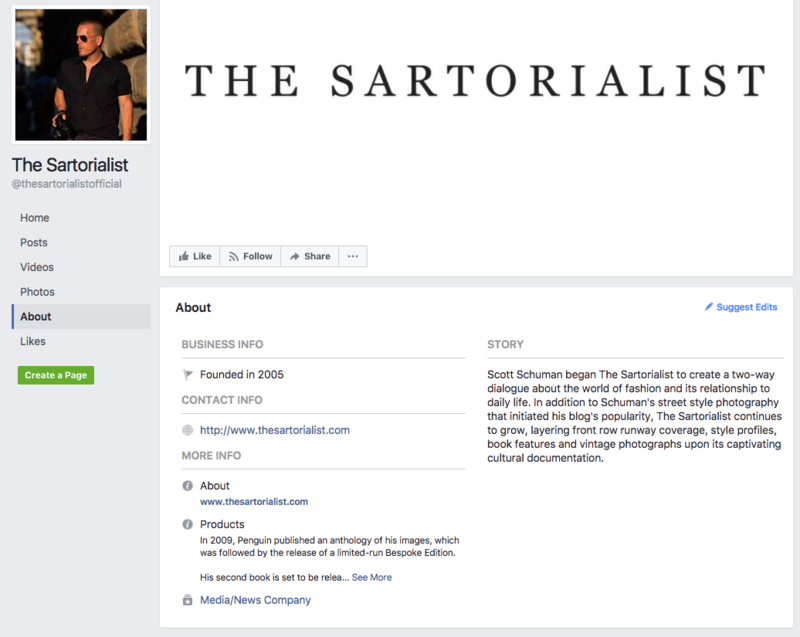 Scott Schuman goes by The Sartorialist online but even a search of his name will turn up his blog. His name is synonymous with street fashion photography and it’s taken him years to build that reputation. After completing your audit, you should now know where your pain points are. Now, to devise a plan on how to reach your goals. Your personal branding strategy should read like a company’s branding guide. From the previous steps, you should already know your goals and where you’re at for reaching them. For example, if you want to be known as a social media expert in the food and drink industry, search for common phrases and see what comes up. If your name isn’t on there or if you aren’t as high as you’d like to be in the search results, write down a plan to create relevant posts. A big mistake that new people make to personal branding is thinking that they need to promote themselves all the time. Much like you don’t want to hear a company’s sales pitch over and over again, you also don’t want to talk about yourself all the time. Take some time to find relevant articles and engage with the community that’s already established around your desired field. If you want to be known as someone who is on top of Instagram news, start sharing new features and your opinions on them. The more consistently you share about this topic, the more people will start to associate you with that topic. 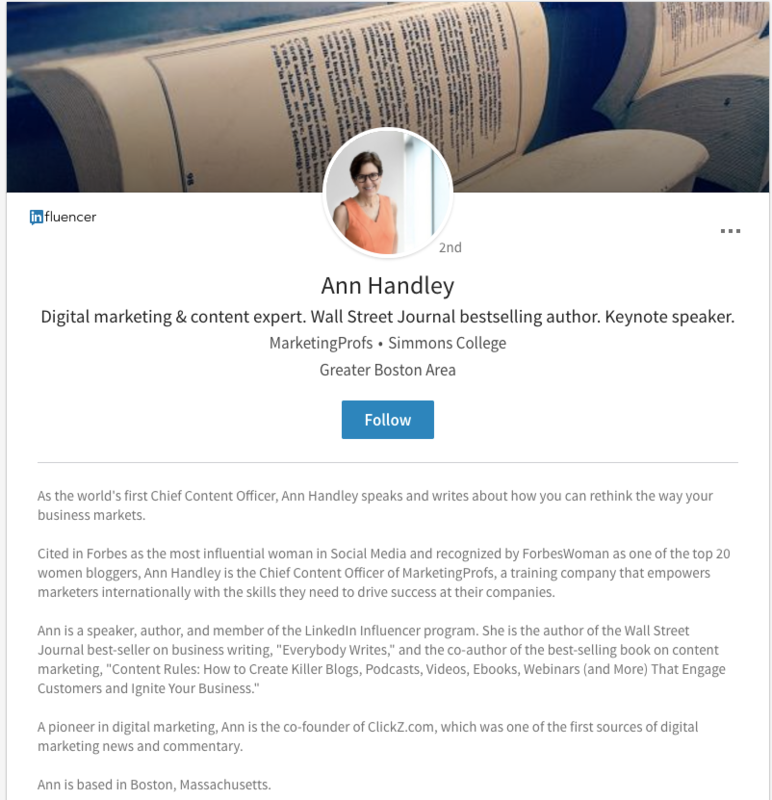 Ann Handley is the Chief Content Officer at MarketingProfs but also has her own established personal brand as a social media expert. When you’ve reached a certain audience size, you may find that your online presence needs to be managed more effectively. 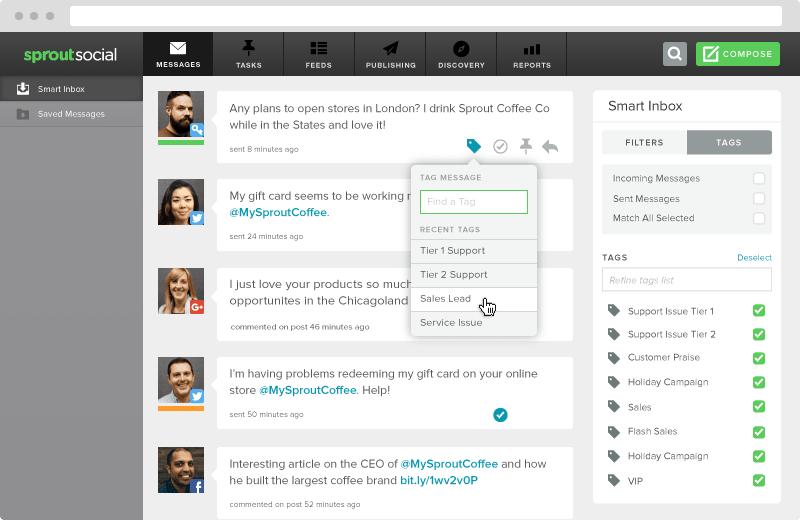 Our single-stream Smart Inbox feature can help you monitor and respond to incoming messages across multiple networks, leaving you with more time to work. After a few months of posting according to your strategy, you may find that you’re not getting the engagement you want. Maybe people aren’t clicking on links or you feel like you’re shouting into the abyss. 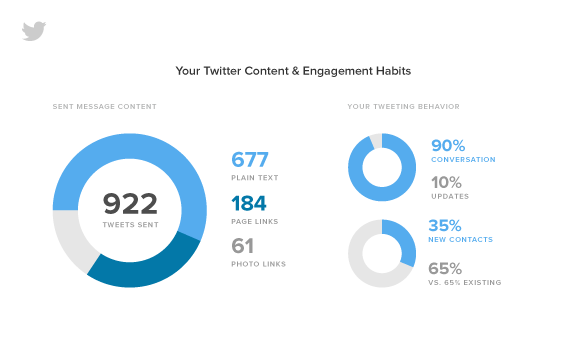 Take time to look at your social media analytics just like you would for a company. Are you responding and engaging with people you follow or are you only sending Tweets out with the hope that someone will reply? This last step is optional and sometimes it’s already decided for you. If you’ve been posting about a certain subject and interacting with people on the topic, chances are that you’re seen as an influencer in that field. Influencers are coveted by companies now as another way to reach new audiences. To take a look at how you rank among influencers, visit Buzzsumo to see where you are in relation to others in your field. This is what brands see when they’re researching for influencers. Make it easy for them to contact you by having information on your website about working with companies. In the end, establishing and keeping track of your personal brand is an important part of your general life. So much of our lives are already online and everyone from employers to potential dates run searches on your name. Why not make sure that you’re broadcasting what you want to the world? Ask your friends and industry colleagues what five words they associate with you. Don’t be afraid to let your personality show through. Make your profile photo and your posts authentically you. Lift other voices up in your posts. Your personal brand is based off of an innumerable amount of interactions that you have with multiple people. Share their work in your feed as a way to engage and thank them. Consider hiring a personal branding expert. Sometimes a third party is what you need to tell you what’s missing. If your work heavily relies on your personal brand, hire a coach to advise you on how to better present yourself. What methods have you tried to be successful at personal branding? Who do you admire with a strong personal brand? Leave your answers in the comments below!